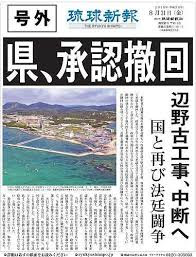 After a long silence, the Abe government has finally admitted that the construction of a U.S. military base at Henoko-Oura Bay in Okinawa requires significant changes to the original land reclamation plan (see Asahi Shimbun). Parts of the seafloor of the construction site have proven to be extremely fragile, having the consistency of mayonnaise. To solidify the seafloor sufficiently to support a functional airport, a “sand compaction pile method” needs to be carried out (see this video for sand compaction pile method). Casing piles will be driven into the seafloor as deep as 60 meters (or 90 meters below the water surface), and the piles, which are hollow, will be filled from the top with sand and other compacting materials. Then the piles are raised or removed slowly leaving the compacting materials in the form of a pillar, thus solidifying the seafloor. This procedure is to be repeated 76,000 times, implanting 76,000 compacting pillars in the seafloor (see Ryukyu Shimpo). Reclamation experts have said that while the sand compaction pile method has been successfully carried out in other regions within Japan, it has never been done to a depth of 90 meters, and there are no pile drivers in Japan capable of reaching to that depth. On this problem the government has so far offered no comment. The government’s admission has critical implications not only for the Japanese government but also for the U.S. and international institutions. The Abe government’s admission has placed the government in a difficult situation. 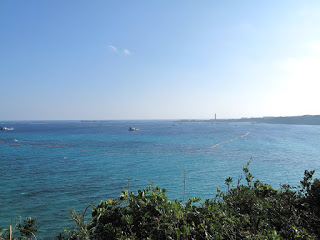 First, implanting 76,000 piles into the seafloor is certain to have a tremendous impact on, and cause irreversible changes to, the environment of Henoko-Oura Bay, one of the most biodiversity-rich marine environments in the world (see Okinawa Prefectural Government). This poses a significant challenge to the Japanese government’s pretense that the construction and operation of the base will not create adverse effects on the environment (hence base construction is legal). The pretense was made possible by the Okinawa Defense Bureau’s Environmental Impact Assessment (EIA) (2012), which has been vehemently criticized for numerous flaws by experts and environmental NGOs. The government’s admission is the latest blow to the tainted EIA and to the government’s environmental claims concerning the viability of the Henoko-Oura Bay project. The EIA made no mention of the mayonnaise-like condition of the seafloor. Second, the proposed changes (or any change of this magnitude) to the original construction plan require a new environmental impact study and approval from local governments. Given that Okinawa Governor Denny Tamaki was elected in a special gubernatorial election in September 2018 on his pledge to fight the base construction, he is expected to deny any proposal for changes (see Ryukyu Shimpo). His refusal to permit construction will drag the entire base construction plan down, causing a halt or a long delay. At this juncture, the Abe administration is downplaying the magnitude of its admission, insisting that construction work will continue. In fact, the Okinawa Defense Bureau is starting to build a new seawall in the area near the fragile seafloor (see The Japan Times). Many see this as the government’s attempt to create a fait accompli by giving the impression that construction work has passed the point of no return. In short, the Japanese government is resorting to its usual tactics. Throughout its reckless pushing of the construction plan, every time environmental issues came to light, the Japanese government has attempted to sweep them under its administrative rug. It has repeatedly prevented examination of the issues and continued to insist that the “no environmental impact” study was sufficient, thus enabling construction to move forward despite engineering evidence of the dangers. Most recently, in August 2018, when the Okinawan prefectural government revoked the land reclamation permit for base construction on the grounds of serious environmental and civil engineering problems (see the Okinawa Prefectural Government’s Revocation Documents in English), Ishii Keiichi, the Minister of Land, Infrastructure, Technology, and Tourism, came to the rescue, and denied the revocation. 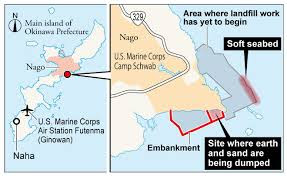 The Minister claimed that revocation of the permit would negatively impact the U.S.-Japan alliance and make it difficult to eliminate the dangers posed by the Futenma base at its current location (see The Japan Times). The suspension allowed construction work to resume while stifling the environmental and technical issues raised in the revocation documents. Despite the Japanese government’s tactics, however, environmental issues persist. New problems are emerging and old problems are coming back to haunt the Japanese government. The Japanese government’s admission of the fragile seafloor and the need to implant 76,000 piles to solidify it has far-reaching implications beyond Henoko-Oura Bay, Okinawa, and Japan. First of all, it challenges the claims made by the U.S. Department of Defense (DoD) in the U.S. court and could test the integrity of the U.S. judicial system. 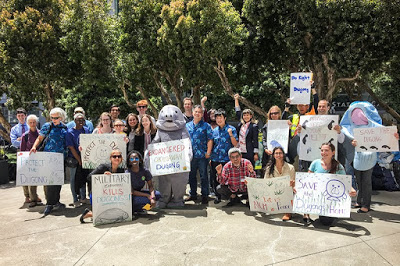 In August 2018, the U.S. Federal District Court of Northern California ruled in favor of the DoD (the defendant) (see the Court Ruling), and against the coalition of civil society members from Okinawa, Japan and the U.S. (the plaintiffs), in a case fought under the jurisdiction of the U.S. National Historic Preservation Act of 1966. The Court accepted the DoD’s claims that prior to the start of base construction work, it had conducted a proper study regarding possible impact of the construction and operation of the base on the dugong, a manatee-like marine mammal, which is an internationally endangered species, Japan’s natural monument, and Okinawa’s cultural icon. 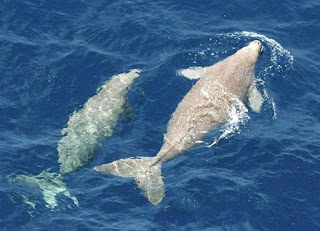 The court accepted the DoD’s 2014 conclusion that the base would have no adverse impact on the dugong. It was this conclusion that finally allowed base construction work to start in July 2014. Now the Japanese government’s admission calls into question the validity of DoD claims since the DoD heavily relied upon the Okinawa Defense Bureau’s EIA in conducting its study and reaching the no adverse impact conclusion. As mentioned above, the EIA did not mention the fragile seafloor or the need to drive 76,000 piles in the Dugong habitat. More importantly, the fact that the DoD did not have this information puts the US court system in a complicated situation, as the case is now being reviewed in the U.S. Court of Appeals for the Ninth Circuit. (see the Plaintiffs-Appellants’ Opening Brief). In an appeals court, documents and evidence to be reviewed are usually limited to those that had previously been examined in the district court. In the dugong case, most of the documents and evidence examined in the district court came from the period before the DoD completed its environmental study and reached the 2014 no adverse impact conclusion. The current critical status of the dugong – no dugong has been observed in Henoko-Oura Bay since construction started and Dugong C has been entirely missing from the waters of Okinawa since 2015 – was not taken into consideration by the district court (see then Governor Onaga Takeshi’s letter to the DoD describing the current status of the dugong). It is not known whether the appeals court will take the Japanese government’s admission into consideration. Nonetheless, the situation presents a critical test of the very objectives and mechanism of the National Historical Preservation Act (NHPA) and the integrity of the entire U.S. judicial system. The Abe government’s admission also presents a difficult test to the International Union for Conservation of Nature (IUCN) because, as an advisory body to the UNESCO World Heritage programme, IUCN is involved in the nomination process of the “Northern part of Okinawa Island” for UNESCO World Natural Heritage status. 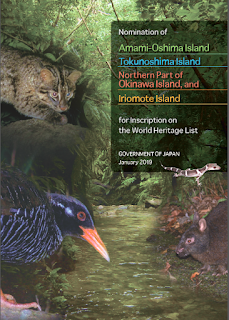 On February 1, the Japanese Ministry of the Environment submitted to IUCN its nomination of Amami-Oshima Island, Tokunoshima Island, the Northern Part of Okinawa Island, and Iriomote Island for World Natural Heritage status (see the Nomination document). This nomination is the Japanese government’s second attempt in the last two years and could be the last. In May 2018, the IUCN recommended that the nomination be “deferred,” (see the IUCN Evaluation 2018) and the Japanese government withdrew it. Among other things, the presence of the U.S. military’s Northern Training Area (NTA) located right next to the nominated area of the Northern Part of Okinawa Island made it difficult for the IUCN to approve the nomination. Henoko-Oura Bay is not included in the nominated area of the “Northern Part of Okinawa Island.” However, Henoko-Oura Bay is just 10 miles away from the nominated area, and is an integral part of the ecosystem of northern Okinawa. 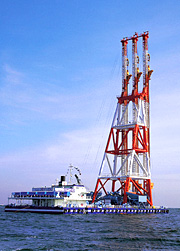 It is inconceivable that the World Heritage nomination process (which will include IUCN experts’ field trip to the nominated area of the Northern Part of Okinawa Island) and the drilling of 76,000 piles into the seafloor in Henoko-Oura Bay can take place simultaneously without each affecting the other. The Japanese government’s admission of the fragility of the seafloor and its relentless push for base construction in Henoko-Oura Bay is a stark reminder that when U.S. military base issues are at stake, Japanese environmental protection measures including EIA cease to function properly, and the Ministry of the Environment no longer behaves as a good steward of the environment. (For the honor of the Ministry, it should be emphasized that it did a fine job of preparing the environmental case for the other four areas inscribed as World Natural Heritage sites and is well-maintaining them). The situation tests the integrity of IUCN as the world’s trusted institution for the conservation of nature. 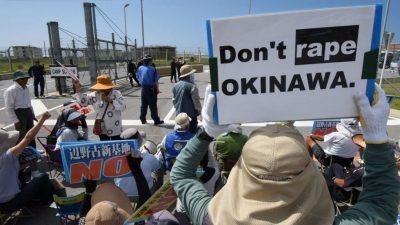 For more than twenty years, the people of Okinawa and members of international civil society have been urging the Japanese and U.S. Governments to abandon the base construction plan. Okinawa already has too many U.S. military bases on its soil. The environment of Henoko-Oura Bay, with some 5,300 marines species including 262 endangered species and peaceful communities with rich cultural traditions, is by no means an ideal site for an environmentally intrusive military base and training area. It should be a place for international collaboration for environmental protection and conservation. It is time for the U.S. Government (the executive, legislative, and judicial branches) and IUCN to tell the Japanese Government to abandon this costly and destructive plan. Yoshikawa Hideki is Nago-resident anthropologist teaching at Meio University and the University of the Ryukyus, International director of the Save the Dugong Campaign Center and Director of the Okinawa Environmental Justice Project. Author of several major articles on this site.